Last year, Google bought an old paper mill in Finland. Now the company is in process of converting that paper mill into a major data center. 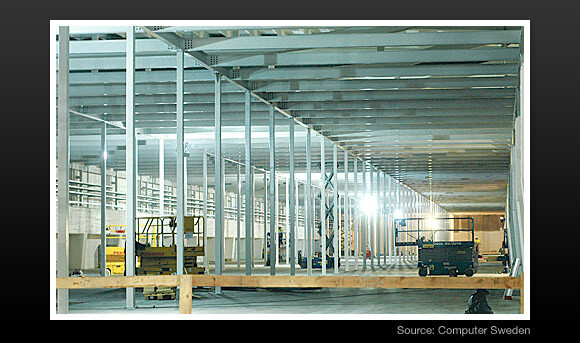 Construction is already well underway, and the data center is expected to go live next spring. It will be Google’s first dedicated data center in the Nordic countries, with several interesting innovations, for example being cooled entirely by sea water. Swedish magazine Computer Sweden was recently on location in Finland and has published an article (in Swedish) with new information and pictures from the build. We’ve summarized the important parts of that article and also what other information we could find around the Web, mostly from Finnish newspaper articles. We’ll go a bit more into detail about the choice of location later in this article, but here are a some quick facts about Google’s new data center in Finland. Will be a €200-million data center. Google bought the paper mill in Q1 2009 for €40 million (just under $52 million). Once the rebuild is complete, Google will have spent €200 million ($260 million), and that amount doesn’t include the thousands of servers the place will house. Legacy of more than half a century. The old paper mill had been operational for 53 years when it was closed in January 2008. Two server halls are planned. The first one will be 8,000 square meters (86,110 square foot). Construction crew of up to 300 people. Currently, 180 people are working on the rebuild, but that will increase to 300 as the build enters its most intense phase in a couple of months. Cooled entirely by sea water. The data center will be cooled using water from the Baltic Sea. It’s pulled in from the ocean floor, where temperature is more even, using pipes that are up to two meters in diameter. Twenty-year-old, renovated pumps from the old paper mill are used to circulate the water. This will be Google’s first data center to be chilled entirely using sea water, and to their knowledge, it’s also the first ever data center to do so. It will use wind power. At least some of the power will come from a newly constructed 12 MW wind park nearby. Some of the land for the wind park was donated by Google. The wind park (owned by the local power company and constructed by WinWinD) currently has four 3 MW wind turbines with rotors 100 meters (328 foot) in diameter. Will go live in spring 2011. It is, however, expected to be operational for testing this winter. Staff. Google plans to employ 50-60 people to run the data center. So far they have found four, so they have some head hunting to do. Googlers will be Googlers. Once Google has hired the entire staff, they will be given free hands to decorate the interior of the place to their liking and make it look like a proper Google site. But seen from the outside, it will remain a paper mill. Security will be tight. Access from land or sea will be monitored by cameras and motion detectors, and the server halls will only be accessible after passing biometric authentication using iris recognition scanners. Although Google started with an existing structure, they’ve had their work cut out for them. To get an idea of how much “cleanup” they’ve had to do, have a look at the video in this article from Finnish newspaper Helsingin Sanomat (the actual video is in English). 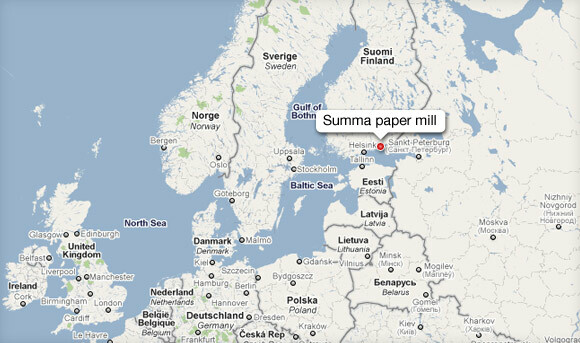 The Summa paper mill is located in Hamina, a small town on the south coast of Finland near the Russian border. It’s not a big place. Hamina has a population of 21,493, the main town housing about 5,000. Why this location, you ask? Proximity to Russia may be a factor. Hamina is near the border to Russia and the area has excellent Internet connectivity that reaches into Russia and St. Petersburg as well as to the west (Sweden, etc). For example TeliaSonera has an international connection that runs right through the area. There have been reports that Google has had trouble establishing itself in Russia, and this may be a way to get around that (being close to but not inside Russia). The climate. Finland has a relatively cold climate and on the coast there is also plenty of access to cold sea water from the Baltic Sea for cooling. Cooling costs are otherwise a major power expense for data centers. Simple geographic diversity. Google is a global operation and has dozens of data centers around the world. Perhaps it was simply time to add a big one to this part of the world. Regardless of why Google is doing this, we think it’s great. Not just because we love seeing these kinds of initiatives so close to home (we’re Swedes), but because repurposing old industrial structures like this paper mill gives the place a lot of personality and is just plain cool. Then on top of that, smart details like sea water cooling add even more to that coolness (no pun intended…). Data sources: Computer Sweden, Helsingin Sanomat (1, 2 och 3), and Wikipedia. Interesting that it will draw water from the bottom of the sea, hope that will not kill a lot of marine life, via filters or treatment. No worries about sealife. Baltic sea is the most polluted one of all the seas, and huge areas of the sea bottom are completely void of life. The problem is a major one especially in the area in the vicinity of google data center, since quite a lot of the pollution comes from st. Petersburg. Watch out Nokia. They’re gonna have a low latency datacenter to power up all Android services and make Nokia look like a n00b in the smartphone space. Doesn’t the Baltic freeze in Winter? Are they taking the water from below where the ice will be? What will be the effect of all that warmed water being put back into the sea? Baltic sea does freeze, but the water stays at constant temperature at the sea floor. The effect of warmed water is most likely negligible, it might create a mini-oasis during the winter. A bit similar what’s seen near Loviisa’s nuclear power plants less than 100 km away. They use sea water for cooling too and dump the excess heat back to the sea. Google is known to be innovative and this data center is first of its kind. @Nick Wright: Ice stays on surface of the water since it is lighter than water. At the bottom of the sea, water seldom freezes. Releasing warm water back into sea will create an oasis like environment which will be a little different from the natural environment. But if the sea is already poluuted, it will make little difference. It will probably encourage Biodegradation of recalcitrant waste. Another factor in the location could be to ensure services into Estonia which has suffered from massive DOS attacks in the past – often linked to Russia – which knocked out most of the country’s internet services. A closer link between the country and a Google datacenter could enable Google to be linked directly into Estonian ISPs if/when they have to block international traffic due to a DOS attack in the future. Great Idea! This is current technology in servers and will speed up access for huge numbers. The water cooling technology is an easier and cheaper way to cool. Did you see this already: http://www.fincloud.freehostingcloud.com/ Finland seems to have all the advantages as a location. Very savvy from Google! nice to come across a blog every once in a while that isn’t the same unwanted rehashed information. Wonderful read!